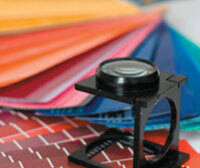 Digital printing allows you to print color quickly and more affordably. At SmartColor Graphics, our digital printing services are ideal for lower quantity projects, or when you just need a quick turnaround. We also offer a variety of paper sizes and weights, and we can print one color to full color – whatever your next project requires to be a success! Remember, color speaks and color sells! Using the latest in digital printing technology, SmartColor Graphics will deliver your project in rich, vibrant color.